Alaska Trail Guides is locally owned and operated in Anchorage. Nestled at the base of Chugach Mountains, wrapped by Cook Inlet, Anchorage is as unique and dynamic as the state in which it belongs. Anchorage is the gateway to Southcentral Alaska and the Interior, a playground so vast it stretches from the temperate rain forest of Kenai National Forest, to the majestic timelessness of Denali. Alaska Trail Guides provides the opportunity to explore these areas with a local, knowledgeable guide. Our passion is sharing our great state with you, providing technical know-how and natural history. At Alaska Trail Guides we are you own personal travel concierges, starting from when you make your first inquiry. Our team is driven to provide exception customer service and local knowledge so you can feel confident and comfortable planning your Alaska dream vacation. Your guides personal experience and enthusiasm enables them to blend instruction with interpretive knowledge to provide an extraordinary experience. Enjoy the moment, leave the logistics to us! Elly has called Alaska home since 2003. After a decade of working in the guiding industry in Alaska, co-owner Elly followed her dream of starting her own outfit. Along the way, she developed a sense of the kind of experience that those traveling to Alaska search for. Alaska is a place of wonder, a sanctuary, not only for people who travel here but for all the natural world as well. While with in Alaska and with us, you can connect with the wilderness and people in Alaska in a way that can be difficult to find elsewhere. Elly combined her passions and experience, putting together 11 years in the guiding industry and 9 years of cycling, to co-found Alaska Trail Guides. When she's not working at AKTG, she is out on her own adventures with her partner and their black lab doing anything from trail running, mountain biking, climbing to traveling. She strives to have extraordinary experiences every day; come join her and her team on one today! Frankie is a second generation Alaskan, born and raised in Fairbanks. She studied marketing and business management at the University of Alaska Fairbanks. After completing her MBA, she moved to Anchorage and started working as a Marketing Manager. Her passion for the outdoors and background in customer service, marketing and systems management lead her to co-found Alaska Trail Guides. From guiding to managing she love to do it all! When you call, Frankie is most often the one who will answer, ready to provide you with answers to your questions. In her free time, she loves to play hockey and go biking, hiking and traveling..
Born in Ohio, built of wanderlust, Derek Meier has been a wilderness guide for over 15 years. His obsession for all things outside started by getting lost in the woods around home and being late for dinner much to his mother’s dismay. 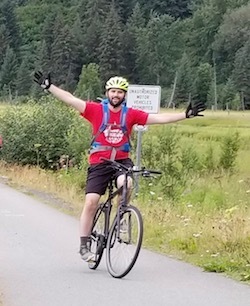 To fuel his adventures, he biked 50 miles to his favorite donut shop throughout high school and so began his love affair with the bicycle (and donuts). As luck would have it fatbikes became popular at the same time he failed to pass Jr. Nordic as an adult and like an omen from above, he embraced fatbikes, the winter wonderland of Alaska’s trails, and very low PSI’s. Inti loves Alaska. His parents were teachers in a remote part of Alaska, allowing him to grow up in the wilderness. He spends his summers fishing and mountain biking with his wife and his winters studying at the University of Alaska.